Much like its popular Donruss Optic predecessor, the all-new Contenders Optic creation aims to seamlessly meld two proud pieces of the Panini America product portfolio — Contenders Football and Prizm technology — into one shiny new release capable of standing on its own merit for years to come. 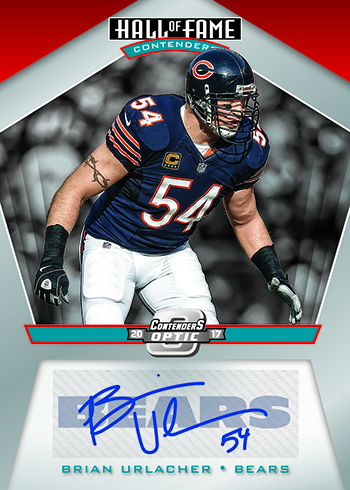 Set to arrive at Sports Cards Plus on Wednesday, March 7th, Contenders Optic Football will deliver, on average, two autographs (including one on-card), two base cards, one parallel and one insert in every six-card box (10 boxes per inner case, two inner cases per master case). The highlights of the new product are many and include . 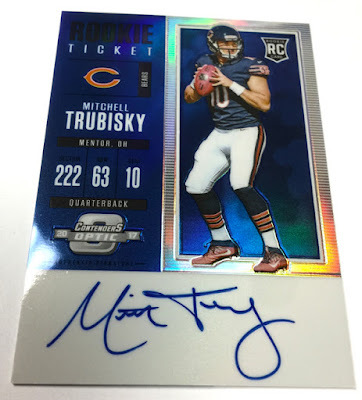 . .
fabled RPS Rookie Ticket Autographs on Optichrome technology; look for one on-card RPS Rookie Ticket Autograph per box. 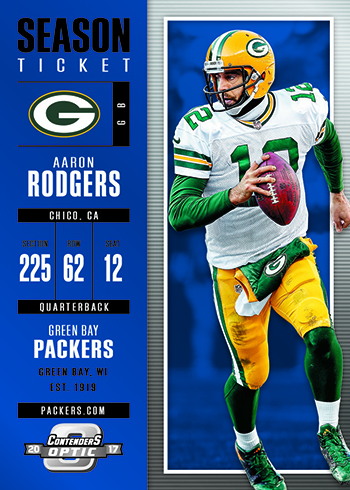 --- Contenders Optic is loaded with inserts such as Hall of Fame Contenders, All-Pro Contenders, MVP Contenders and Round Numbers. 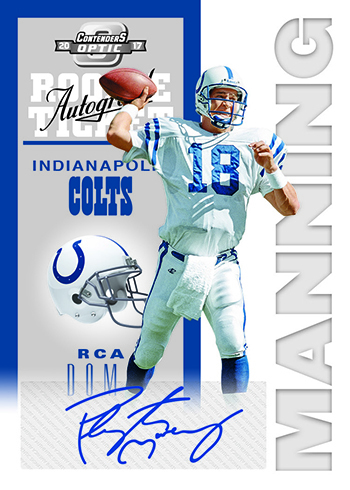 --- Some of the most iconic Contenders Rookie Tickets of all time get recreated with Contenders Tribute Autographs, honoring the best cards made in 1998, 1999, 2000 and 2001. --- Optichrome technology revamps the always-popular Contenders brand. With Red, Blue, Gold and Gold Vinyl parallels (numbered to 199 or less), Contenders Optic is loaded with short-print chase cards. 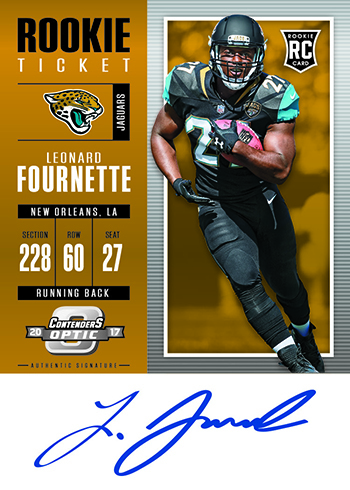 --- Rookie of the Year Contenders Autographs highlights the top rookies of the 2017 class, all numbered to 99 or less. --- Hall of Fame Contenders Autographs highlights those legendary players headed for Canton in the near future. 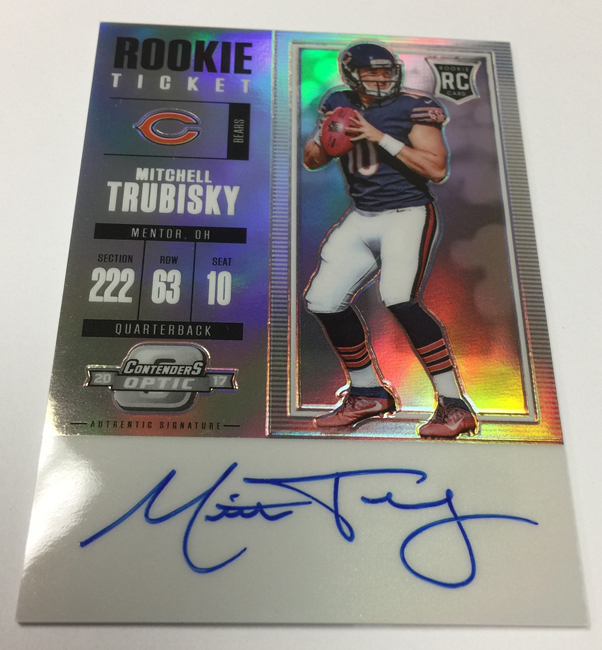 2017 Panini Contenders Optic Football gives the perennial brand a new, more high-end leaning configuration for the product. Rather than having several packs per hobby box like Contenders usually, 2017 Panini Contenders Optic Football is a single-pack box. Each has six cards, two of which have autographs. Among them? A shiny spin on the Rookie Ticket Autograph. Similar to how 2017 Donruss Optic took the regular 2017 Donruss set and made it shine, 2017 Panini Contenders Optic takes many of the same elements as 2017 Contenders. That means a shell set incorporating the same Season Ticket design. Base parallels, which come numbered to 199 or less, include Red, Blue, Gold and Gold Vinyl. 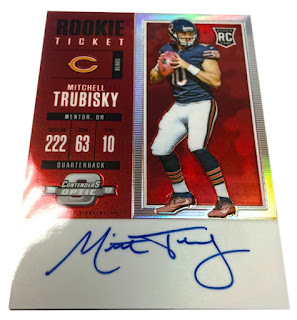 Rookie Ticket RPS Autographs are one per box. 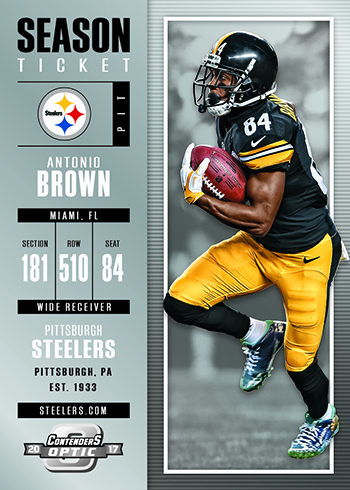 These have on-card signatures and include key members of the 2017 rookie class. Like the base cards, there are parallels as well with Gold Vinyl being the rarest with just one copy each. The Ticket autographs have long been a cornerstone component of Contenders. 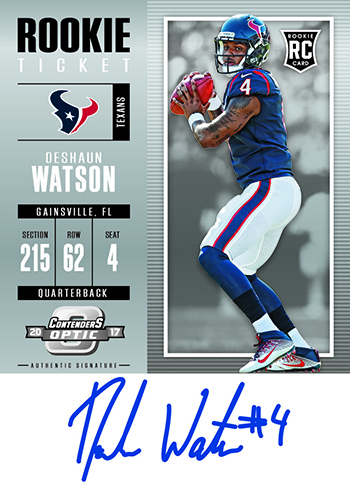 But they’re not the only signed cards in 2017 Panini Contenders Optic Football. Among them are Hall of Fame Contenders Autographs, which highlight players who are up for Canton consideration. Rookie of the Year Contenders Autographs, which have no more than 99 copies each, offer up more first-year signatures. Round Numbers Autographs get chromed. These pair up ink from two players taken in the same round of the draft. Some of the earliest Rookie Ticket Autograph designs are recreated for Contenders Tribute Autographs. These cover 1998 through 2001. 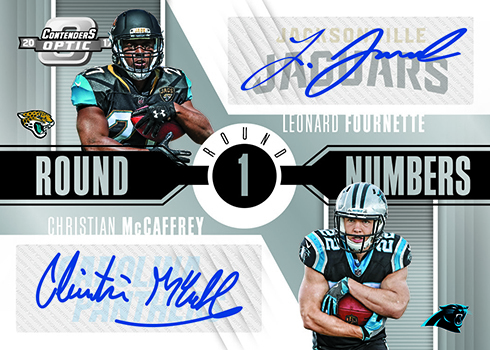 2017 Panini Contenders Optic Football comes with one unsigned insert per box as well. These include unsigned versions of Rookie of the Year Contenders, Hall of Fame Contenders and Round Numbers.